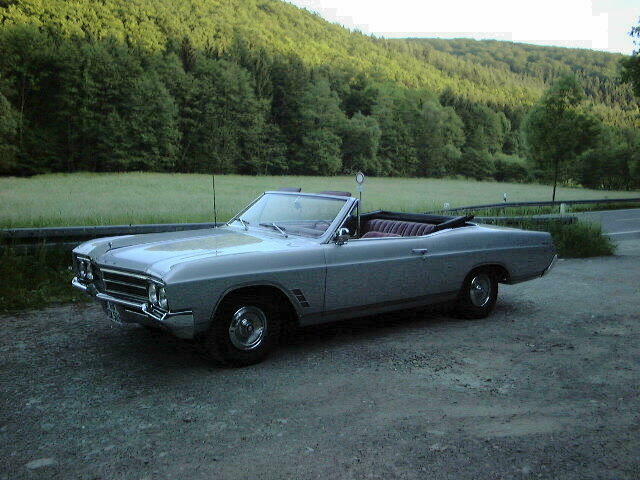 I'm Stefan from Germany, and I own a 1966 Buick Skylark convertible which has been in our family from new. 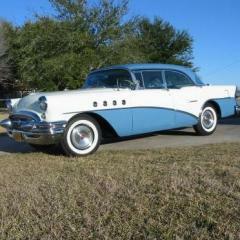 The Buick is equipped with the 300ci V8 and automatic transmission. Car is bone stock except the choke system which has been replaced by an electric unit. Original Rochester 2GC carb though. I have obtained a reconditioned distributor (Cardone) and put it in, together with new rotor, spark plugs and leads. According to my workshop manual, timing is set to 2.5 BTDC at idle with vacuum disconnected. Car runs and idles fine doing so, but when I connect the vacuum advance the engine dies immediately. With the vacuum put on, I cannot get it to run properly, cause the distributor can't be rotated enough. The vacuum advance is connected to the port below the carb, passenger side, or? I will recheck installation tomorrow after work, but this is not the first distributor I installed and it should be fine. I am going to assume you knew to check and make sure the rotor was in the exact same position as the old one. You sure that lark has a 300?? My Chilton's shows a 340. Anyhow, 2.5 BTDC is correct. Your idle, with the car in Drive, should be 500, add 50 if its got air conditioning. If your idle is too low, that could be part of your problem. Also check your dwell, you should be at 30 degrees. Distributor/rotor is set in per spec, dwell is 30° spot on, idle is a tad high @ 600 rpm but that should be ok for now. Engine runs great with vac disconnected, no miss, lots of power. Engine is 300ci for sure, but is called the 310 due to the torque rating. 340 is the same engine, but afaik with longer stroke. I know the engines for these cars.. but thats a moot point. One last dumb question, don't be offended. Are you checking your timing off of number 1?? yes, I'm checking the timing by #1, foremost cylinder left bank (driver's side). What puzzles me is that the vac advance does alter the timing so much! Could, for any reason, be there too much vacuum force? Perhaps due to the modified choke setup? Could the choke be way rich and having a controlled vacuum leak is leaning it out enough to run? More likely: the vacuum advance plate moves in the distributor...could you have a bare points or condensor wire that is shorting when the vacuum advance moves? thanks for this suggestion, I will check into this later today. I will also check the level of vacuum force at the distributor and the movement of the advance plate with my vac pump. Bet this one is a winner too!! I have double checked the distributor, the internals are fine, the wires safely routed and the insulation is good. I set the ignition timing to 2.5° with vac disconnected. Engine runs fine, centrifugal advance is working, I see the timing move with the strobe light while revving. When I connect vacuum, I see the timing moving off towards advance way off the scale, and the engine dies, b/c it can't handle that much advance timing. I have checked the vacuum at the connection, it's a full 20 inHg at idle. Should it read that much? Or did they sell me a distributor where the vac advance mechanism does not harmonize with my engine/carb setup? I can't try the one from my old distributor as the diaphragm is shot. Do you have a dial back timing light? Have you ever made sure your balancer hasn't slipped? I run about 12* initial and 8-10* vacuum advance at idle in my Skylark, but I have limited the mechanical advance to run about 31* total (not including vacuum advance). Compare the new vacuum advance with the old one (spring pressure and travel of the arm). All vacuum advance units made in that era will fit, but they are application specific with heavier and weaker springs and travel of the arm. As an example there is no listing for a vacuum advance for my 76 Olds, but there was one for a 74 and since that was close I though it would work. Not! The spring was lighter and it had greater travel that resulted in part throttle detonation. (I ended up using an adjustable unit). ONE possible issue is that with the engine at "base idle", the "ported vacuum" vacuum port on the carb should barely have any vacuum at it at all -- period. Hence the term "ported vacuum", as as the throttle plates are openned, more of the full manifold vacuum is modulated to the distributor via this particular vacuum port. Almost ALL vacuum advance units back then tended to use ported vacuum to run the distributor vacuum advance. 20" of Hg vacuum at idle sounds like you've got a "manifold vacuum" source rather than a "ported vacuum" source. The issue you describe as the engine "dies" when you hook the vacuum source to the distributor, with 20" HG of vacuum available, sounds just the opposite of what it should be. Adding that much extra advance should increase the engine speed significantly, NOT kill it. For example, in '77, my '77 Camaro 305 Federal-spec car uses intake manifold vacuum to run the vacuum advance. When I unhook the vacuum line at the distributor, the idle speed decreases to the "barely running" orientation, with the idle speed correctly adjusted for the "vacuum line attached" situation. If you've got your idle speed (line unhooked) at the desired spec speed, when you attach the 20" Hg vacuum to it, the engine speed should increase a good bit. Not enough additional advance there to lean the mixture enough to kill the engine, either. NONE of these things should relate to the added electric choke situation, I suspect. What parts did you use to convert the car to electric choke? Just curious. On the GM vacuum advance units, there can be a number stamped on the vacuum advance's arm that connects to the breaker point plate. That number relates to the amount of advance the unit will provide. It's the width of the "travel limiter" section of the arm, which is the positive "stop" for the arm against the backside of the vacuum advance section, that helps generate the stamped number. This, plus the spring tension inside of the vacuum can determines the total vacuum advance characteristics of the particular unit. What COULD be happening is that the added vacuum advance could be pulling the breaker plate enough to put the point dwell into a very decreased number that might make the spark weak enough (decreased dwell = weaker spark, usually) to not fire the plugs, even if it checks at 30 degrees with the vacuum hose unhooked. What about if you swapped the old vacuum advance unit with the new one? What was the issue with the old distributor? Remember, too, that when you get a "reman" or "rebuilt" distributor, you never really know what you're getting, with respect to the combination of advance weights and springs, even if the rebuilder's part number shows it to be correct for "your engine". The stamped number on the "pad" no longer "works", either, as a general rule, as that number reflects the combination of advance weights, springs, and vacuum advance for the original production engine/vehicle combination . . . ONLY. In other words, you get "something that will work" rather than the specific item the factory designated for your particular vehicle/engine combination. In reality, though, there is a somewhat wide window of "what will work", just that the factory spec gets it more fine-tuned for the specific engine/vehicle application for the particular model year . . . according to what the factory engineers are seeking to accomplish with that particular calibration. So, with a "dial back" timing light, an accurate dwell-tach, a hand-pump vacuum pump, and vacuum gauge, you can fully document the existing advance curves of your rebuilt distributor. When the mechanical advance starts (engine rpm), when the vacuum advance starts (min. vacuum level), and what they both are at about 2500 rpm (which probably should be in the 50 degree advance range, typically). You might need to check for a deteriorated carb gasket that might be allowing manifold vacuum to travel into the ported vacuum vacuum lines, inside of the carb. Using a soaking spray carb cleaner to do this, focused on the throttle body to base plate gasket, might cause a "false positive" as the cleaner might saturate the paper-type gasket and raise the idle speed as a result. So, less spray is best. Please keep us posted . . .
thanks a lot for your very helpful thoughts. Aaron65, no, I have a standard timing light, no dial back. Balancer is spot on TDC with marking, I checked with a plastic rod in the cylinder moving the piston up and down. Old-Tank, yes you are right, the vac units are different. The travel of the new unit is significantly longer. I limited the travel by adding a little bracket to the guide, but not much better. NTX5467, I was wondering too that there is no ported vacuum port at the carb, just this one giving manifold vac at idle. The workshop manual does not give any detail about this, neither in the carb nor in the distributor section. Decide to inspect the old distributor. Points shot. Centrifugal advance hardly moving. No play in shaft, good. Vac unit shot. Decide to give it a try. Renew points, take apart centrifugal advance, clean, lube. Set engine to TDC, rip out reman distributor, put in freshly tuned (except vac unit, of course) old distributor, set static timing. Start car, no problem. Then adjust dwell and set timing with strobe. Engine runs great. Make test drive, engine performs well, no pinging. Idles good. Then fiddled a bit with the carb adjustments b/c it had a tendency to run rich, now better. Engine now running *very* well with the old distributor! So, something seems to be wrong with the remanufactured distributor. I inspected it closeley, but could not find a problem. I will leave in the original one for sure! But I do need the vacuum unit, obviously. It is stamped MS 210 16 . Does anybody know where to get one of these? The seller should be willing to mail overseas, thou. Once again, many thanks to all of you for your support! You know, I hate new parts. I just had this issue with MY Skylark. I bought a new, defective radiator, so instead of replacing it with another new one, I had my old one cleaned out. You MAY want to give rebuilding your own carb a try. That way you KNOW it's done right. The car runs OK now, so why risk a new one? Vacuum advance canisters are easy to find, with shipping being your biggest problem. You can always tailor the total vacuum advance by limiting it, like you said you did. Good luck and let us know how it turns out. Make sure that you do get the vacuum advance working, because it reduces engine temperatures and increases your fuel mileage. EDIT: Come to think of it, Stefan, why don't you try the new distributor's vacuum advance canister on the old distributor? It should fit fine...just to see what happens? I see your point, and agree. Much to my regret sometime along our car's life a mechanic has butchered the original carb. The original tangs are missing, worn threads have been re-tapped in metric sizes and the like. Also the original choke system has been removed entirely, the heat pipes, exhaust flap, all gone. That's why I ordered an overhauled carburetor. I plan to keep the old one for spares I might need in the future. Hopefully, you'll have good luck with the carb, over my car's life I have replaced 3 of em, all good success. I hate new parts too, replaced starter and solenoid only to have the solenoid not work, of course after I had installed it! !